When Stephen DiVerdi first joined the Adobe Research team he was just an intern. Today, after spending three internships at Adobe, five years as a senior research scientist here, a short stint at Google and three more years at Adobe, he’s a principal scientist. To get a better look at his career, we sat down with Stephen to talk about his journey and about the immersive technology he’s working on now. What initially drew you to Adobe? And what drew you to come back after you left? I have a long history with Adobe. I was originally an intern for Adobe Research, and I interned a total of three times before I joined as a research scientist after I graduated with my PhD. The opportunity to work on creative technology is what drew me in. I worked on natural media painting simulations, “Dynamic Brush,” and I shipped features in Photoshop, Illustrator and our iOS apps. Later, I was curious to see what else there was—see if the grass is greener on the other side. It really put things into perspective. Turns out the “bad” things weren’t really bad, and the good things were actually very unique. When I was at Google, I found that I didn’t have the broad impact and breadth of projects I worked on at Adobe. I’ve been back for the last three years, and I’m focusing more on virtual reality (VR) now, which is what my passion is. What originally got you interested in VR? Honestly, it was during my 12th birthday in 1992. I went to the arcade and there was a VR game called Dactyl Nightmare where you wear a headset and you’re teleported to an abstract chessboard looking arena. Looking back at it now, it was comically bad but it was one of the coolest things I’d seen in my life. It really got me going. In grad school I jumped at the chance to work on augmented reality. I had my own lab and I thought it would be a good idea to make my own virtual workspace rather than work in my physical one. After about five minutes with the headset, I was so sick and uncomfortable. Seeing how the tech has developed since then is wild. When I put on a headset now, the experience feels complete to me. I feel that I can fully realize my vision with virtual reality now. Tell me a little about the work you’re doing now at Adobe Research. I work on immersive technology. Right now I’m working on virtual reality video editing with the Premiere Pro and After Effects teams. 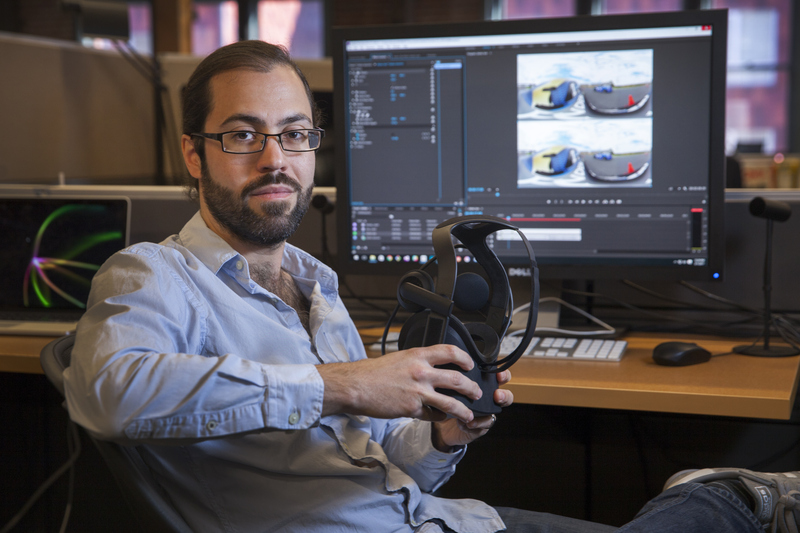 Essentially we want to make it possible to edit videos directly with VR headsets. Right now you have to go back and forth between the headset and video, but we want to eliminate that task. During your tenure at Adobe, what are some of your proudest achievements? I’m proud of my patents and published papers, and working on the brush technology in Photoshop and Illustrator. That was big for me. And now working on VR is really exciting. Working at Adobe Research itself is amazing. We work with interns, product teams, engineers, and get to see the whole cycle. You research new ideas, and you help write the code on these products that get shipped and then see people using it. How does the environment at Adobe Research help advance your work? It’s huge and full of brilliant people. It can be intimidating but there’s no shortage of ideas. When you work with experts you learn new ways of thinking. We have a large number of projects happening at once and they cross pollinate often, which is good because we get to share solutions and collaborate. At other companies, you’re all just working on the same big thing, which can be good. But serendipity can be lower, which is something we try to maximize here. You never know what’s going to come out of it. Pull on a thread and it might become a feature in a product! What would you say to someone who might be interested in pursuing an opportunity at Adobe Research? When you’re in a PhD program you often focus on a particular topic and go really deep. That leaves researchers out of sorts when they come here, because the breadth of work we do is really wide. People who do well here are the ones who wear many different hats and find work where they can help others. Bring your expertise but also be willing to learn new things and work cross functionally. This story originally appeared on the Adobe Life blog. Adobe Research shared our latest computer vision discoveries at the IEEE Conference on Computer Vision and Pattern Recognition (CVPR 2018), held this June in Salt Lake City. Sonic Scape helps 360 video editors “see” ambisonic sounds in a video using color particles, enabling a unique style of visual editing of the sound’s origin in space and time. Is there a low-cost, easy-capture way to improve the realism of VR video? Adobe Research has found a promising path with Sidewinder.